contrast image of Saturn with three moons: Tethys and shadow, Dione, and Rhea. 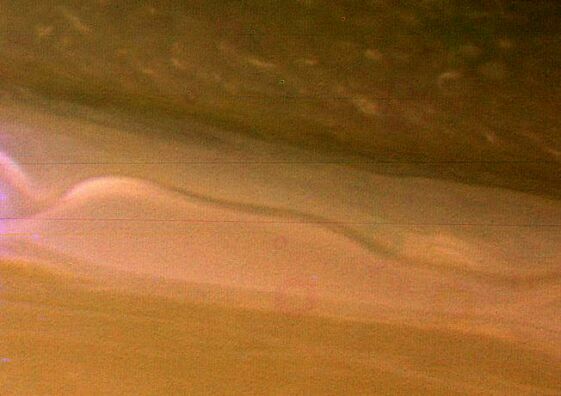 On July 6, 2011, the NASA / ESA Cassini Imaging Team released a true color image of the storm in Saturn's northern hemisphere which had a tail that wrapped around the planet by February 24, 2011, when the image was taken over 12 weeks after the storm began. Still active on July 6th, it then covered 500 times the area of the largest of the southern hemisphere storms observed earlier in the Cassini mission. Planetary scientist observed that the shadow cast by Saturn's rings has a strong seasonal effect, and so the switch to powerful storms now located in the northern hemisphere may have been related to the change of seasons after the planet's August 2009 equinox (CICLOPS image diary; JPL feature release; Tammy Plotner, Universe Today, July 6, 2011; and Astronomy Picture of the Day). 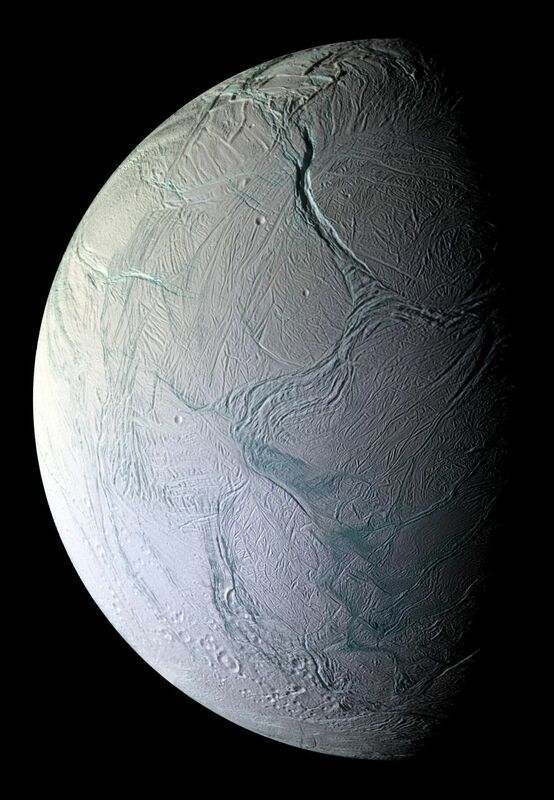 On June 22, 2011, scientists working with the Cassini spacecraft revealed that the "best evidence yet" of a large reservoir of saltwater beneath the icy crust of Saturn's moon, Enceladus. Analysis of salt-rich ice grains close to the jets ejected from the moon by Cassini's cosmic dust analyzer indicate that grains expelled from fissures, known as tiger stripes, are saltier (in sodium and potassium) and larger when collected closer to the moon's surface. "The salt-rich particles have an 'ocean-like' composition and indicate that most, if not all, of the expelled ice and water vapor comes from the evaporation of liquid salt water." As a result, the scientists argue that their data support the existence of a layer of water between the moon's rocky core and its icy mantle (a subsurface ocean), that may be as much as 50 miles (80 kilometers) deep. As this water moves through rocks, it dissolves salt compounds and pushes through fractures in the overlying ice to form reservoirs closer the moon's surface, where it is expelled into space when the outermost layer of the crust cracks open and the resulting depressurization of these reservoirs causes water vapor and ice particles to shoot out in the observed plumes. These water reservoirs must be large enough to provide sufficient evaporating surface that freeze too slowly to stop the formation of the plumes and to spray out water vapor at the high rate of 200 kilograms (400 pounds) per second. Results from Cassini's ultraviolet imaging spectrograph also support the presence of a subsurface ocean as the measured speeds of the water vapor gas expelled in distinct jets from the moon's south polar region were found to be five to eight times the speed of sound (NASA news release; Postberg et al, 2011; Jason Major, Universe Today, June 22, 2011; Marc Kaufman, Washington Post, June 22, 2011; and Sindya N. Shanoo, New York Times, June 22, 2011). Larger and jumbo, close-up images of plumes. The sixth planet from the Sun (at 9.5 times the Earth-Sun distance) may be smaller than Jupiter, but its bright rings have been a marvel since their discovery. 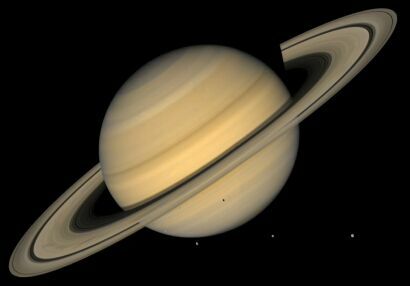 Although it is the second largest planet in the Solar System, Saturn is actually much less massive than Jupiter with only about 95 times the Earth's mass. However, it also has 9.4 times Earth's diameter at about 120,000 km (75,000 miles). 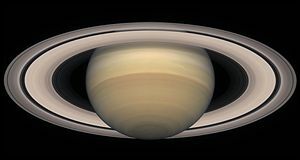 Because Saturn is actually quite large for its mass, the planet has has the lowest average density of Sol's planets and would float in a large enough body of water because it has only seven tenths of water's density. 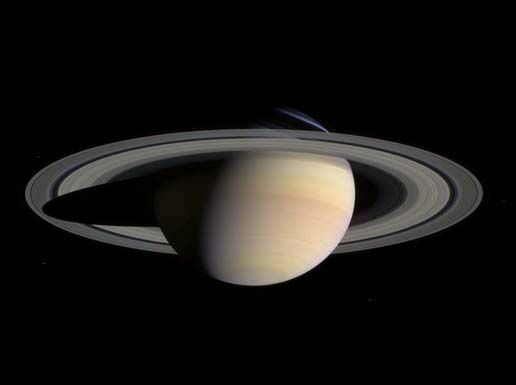 It is flattened at the poles due to a very fast rotation of less than 11 hours per Saturn "day," but the planet takes 29.5 Earth years to complete an orbit around the Sun. 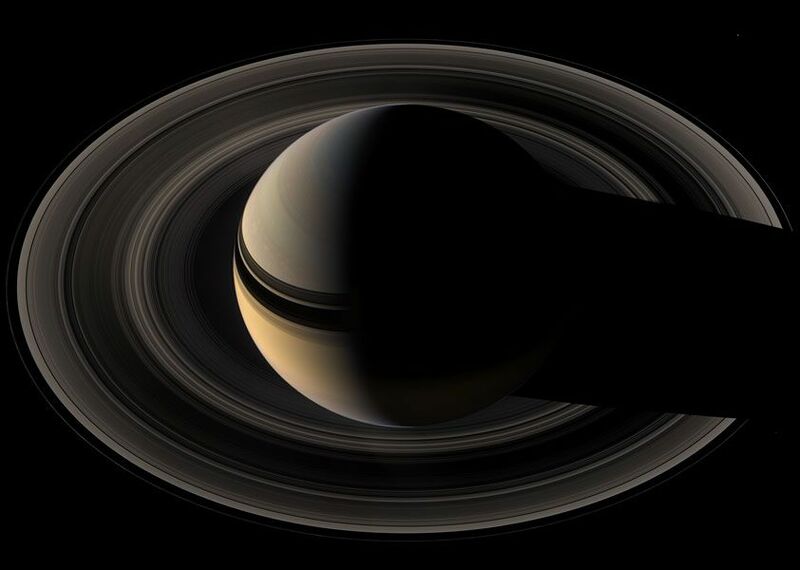 According to astronomer Richard Crowe, since Saturn's polar diameter is about 10 percent less than its equatorial diameter, the planet may have a larger and less-compressed rocky core than Jupiter, with about 2.5 times Earth's diameter and around 20 times Earth's mass -- around 16 percent of Saturn's mass -- that is resisting rotational flattening at the poles (Geoffrey W. Marcy; and Astronomy, October 2006); and "Ask Astro", Astronomy, October 2004). are 40 miles (65 km) in diameter (more). Like Jupiter, the planet appears to be made mostly of molecular hydrogen (88 percent) and helium (11 percent) with traces of water, methane, ammonia and rockier elements. As on the other gas giants, winds as strong as much as 10 times stronger than those found on Earth have been detected in the upper levels of Saturn's dense atmosphere. Unlike winds on the inner rocky planets like Earth, which are powered primarily by sunlight, winds on the gas giants are also fed by heat escaping from their deep cores, although the strength of this interior heat is a mere fraction of the sunlight falling on Earth. Like Jupiter, Saturn appears to have a liquid layer of metallic hydrogen lower in its interior surrounding a hot rocky core that may be as hot as 12,000 �C (or F). The planet also radiates more energy into space than it receives from the Sun, of which much is probably generated by gravitational compression like Jupiter. 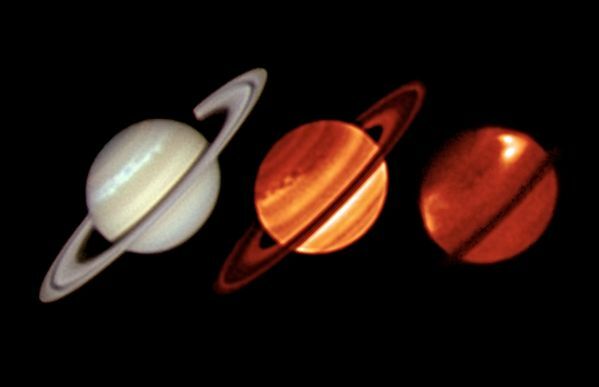 When first detected between 1980 and 1981, Saturn's equatorial regions had winds that were blowing up to 1,100 miles -- 1,800 km -- per hour. 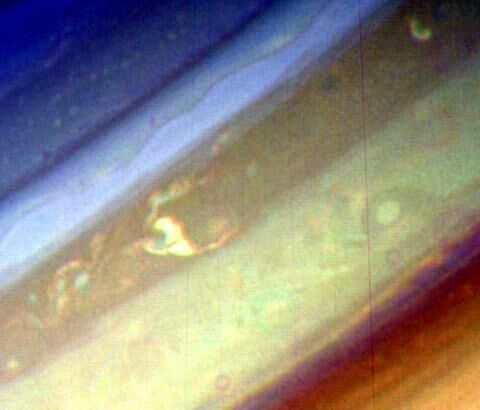 Analysis of Hubble Space Telescope images of Saturn in 1996 and 2001 show that these winds have diminished by more than 40 percent to around 600 miles -- close to 1,000 km -- an hour. 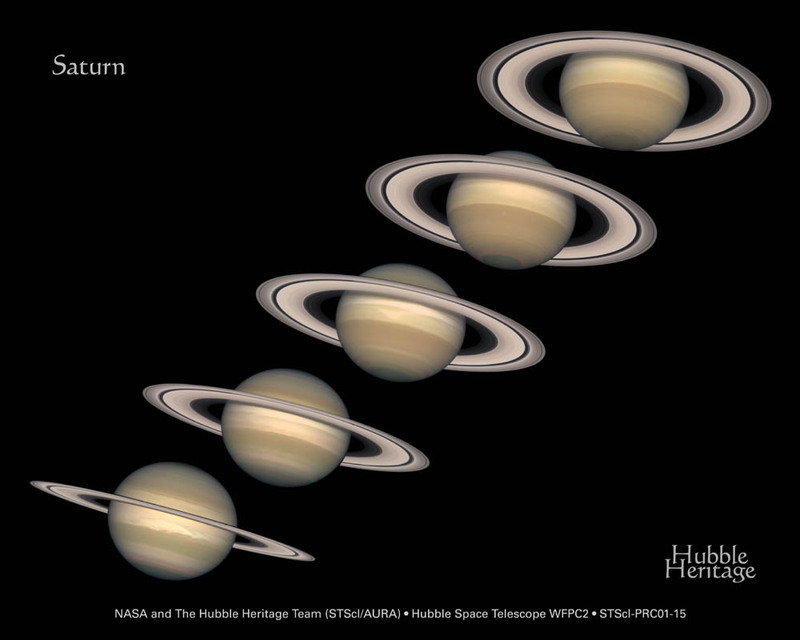 While Saturn has a long seasonal cycle, with one Saturn year lasting around 30 Earth years, its large ring system also shades different sections of the equator as the planet slowly tilts back and forth in its orbit. 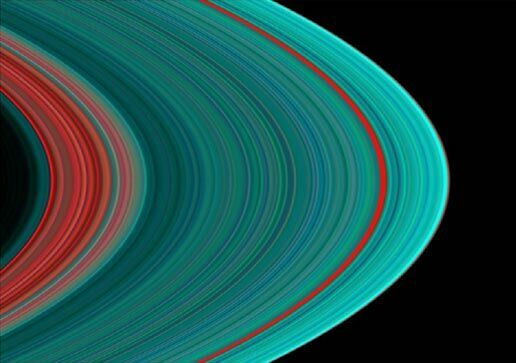 These factors could account for the tempering of Saturn's equatorial winds, which blow within colored bands in opposing directions. These bands are comparatively fainter and wider near the equator than Jupiter's, where giant storm systems (bigger than long-lived storm spots) were also observed in 1990 and 1994. Unlike Jupiter's x-ray emissions which are concentrated near its poles, Saturn was found in 2003 to have stronger x-ray emission from its equatorial regions. 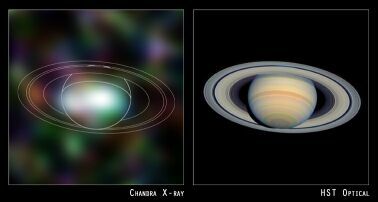 Since the spectrum, or distribution of energy, of the x-rays was also found to be very similar to that of x-rays from the Sun, Saturn's x-ray emission appears to be generated by the scattering of Solar X-rays by Saturn's atmosphere. This was puzzling to the astronomers who first detected the x-rays because since the intensity of Saturn's x-rays would then imply that the planet reflects x-rays around 50 times more efficiently than does Earth's Moon (more at Chandra X-Ray Observatory, and Astronomy Picture of the Day, and Ness et al, 2004). 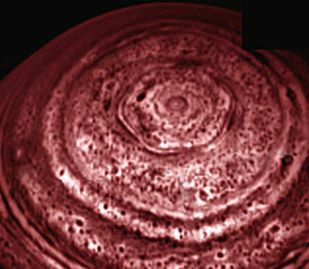 On March 27, 2007, the Cassini-Huygens Mission announced the confirmation of a stationary, hexagon-like "wave" around Saturn's north pole at around degrees north latitude that was partially observed by the Voyager 1 and 2 flybys of the early 1980's. The new views of this polar hexagon taken in late 2006 prove that this is an unusually long-lived feature. 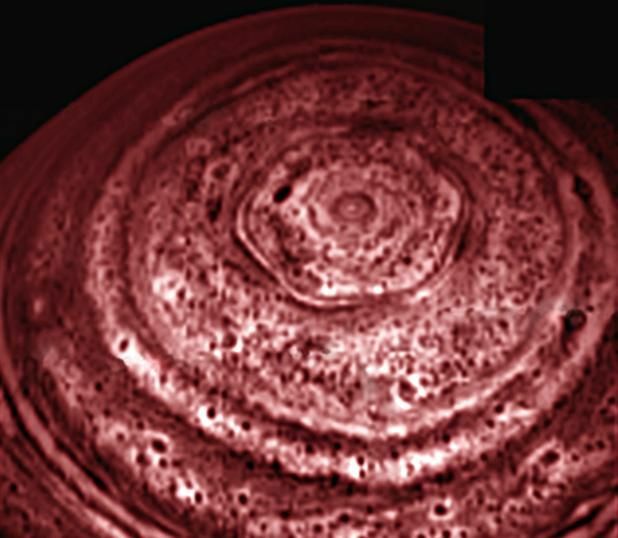 While Earth also has winds blowing in a circular pattern around the polar region, Saturn's north polar cloud deck has a hexagonal shape that is nearly 25,000 kilometers (15,000 miles) across so that nearly four Earths could fit inside it. The images taken in thermal-infrared light show that the hexagon extends some 100 km (60 miles) below the cloud tops. A system of clouds appears to be whipping within the hexagon. The hexagon appears to have remained fixed with Saturn's rotation rate and axis since first glimpsed by the Voyager probes some 26 years ago, but the actual rotation rate of Saturn is still uncertain. 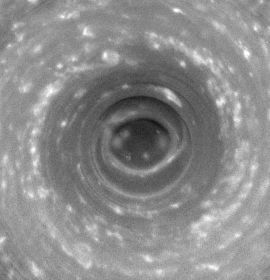 The hexagon can only be detected at infrared wavelengths because it is currently winter in Saturn's northern hemisphere �- a 15-year-long season when sunlight does not fall on the pole. Over the next two years as Spring comes to the north pole, astronomers hope to observe the hexagon in visible light (more from NASA and APOD). 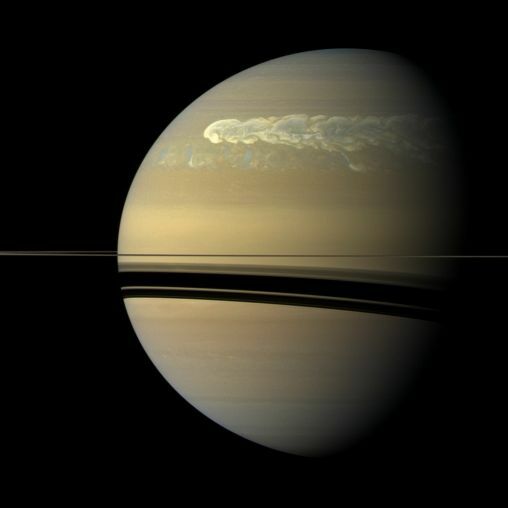 On November 9, 2006, the Cassini-Huygens Mission announced the discovery of a hurricane-like storm at Saturn's south pole that has a well-developed eye, ringed by clouds towering 30 to 75 kilometers (20 to 45 miles) above those in the center of the storm. Centered on the south pole, a swirling cloud mass is moved by winds blowing at 550 kilometers (350 miles) per hour. The "hurricane" spans a dark area inside a thick, brighter ring of clouds and is approximately 8,000 kilometers (5,000 miles) across, or two thirds the diameter of Earth (more from Cassini and APOD). On May 19, 2011, the European Southern Observatory (ESO) and NASA released a composite image of infrared and visible light exposures taken with the ESO's Very Large Telescope (VLT) and with NASA's Cassini spacecraft which highlights details of a major storm in Saturn's atmosphere. First detected by Cassini's radio and plasma wave instrument in November 2007, the lightning emitted by the storm (which was 10,000 times more powerful than those observed on Earth) was also tracked telescopically since February 2008 by Trevor Barry, an amateur astronomer, who with other Earth-bound astronomers has been able to track the storms every night, unlike Cassini. 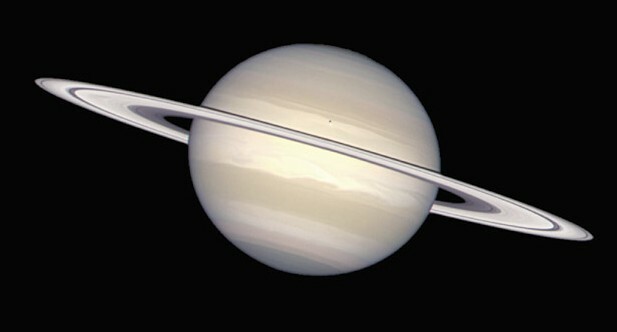 Although Saturn's atmosphere usually appears calm, such thunderstorms have been observed about once every Saturn year (which is roughly around 30 Earth-years long), when spring comes to the ringed planet's northern hemisphere and additional heat penetrates deep below its clouds and eventually creates a vortex as much as 3,000 miles (5,000 kilometers) wide. The rare storm is only the sixth observed by astronomers since 1876 (ESO science release; NASA Cassini news release and Science News; and Richard Macey, Sydney Morning Herald, May 3, 2008). Larger and jumbo composite images. in storm clouds and temperature (more). Larger and planetary images, fact sheet (more). Saturn's renowned rings appear to be mostly made of small particles of water ice, some of which may be coating rocky particles. These ring particles range in size from microscopic dust and pea pebbles to boulders of several meters (or yards), and probably include some larger objects as large as a kilometer (or mile) in diameter. Saturn's rings are 250,000 km (155,000 miles) wide, but only a few tens of meters (or yards) thick in some places. As a result, their total mass may actually amount to no more than a single icy body of 100 to 200 km (60 to 120 some miles) across, as large as Saturn's moon Mimas. Spoke-like features have been observed which may be the result of electromagnetic forces acting on charged, tiny dust particles in the rings. the reddish Encke gap (more). 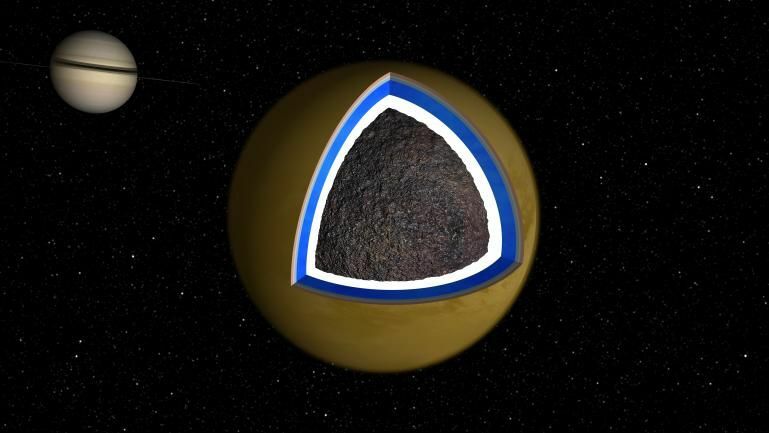 The Cassini Division has been found to contain thinner, dirtier rings than the icier A ring that lies outside of it. Indeed, the bright A and B rings that surround the Cassini Division appear to be very "clean", while the particles in the Division appears to be similar to the dark material detected on Saturn's moon Phoebe. In general, the rings get less dirty and more icy with increasing distance from Saturn (more discussion from NASA Astronomy Picture of the Day). NASA -- larger image (more). 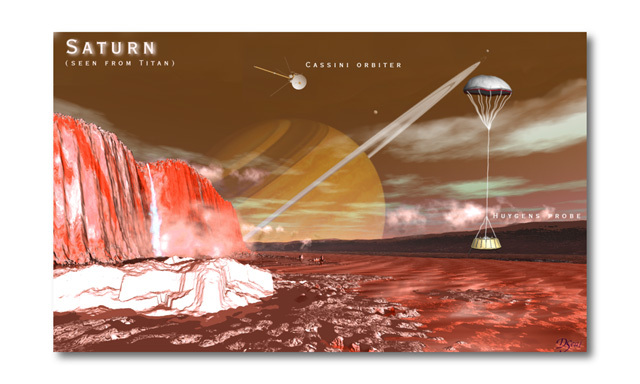 On October 25, 2010, planetary scientist Robin M. Canup proposed at the American Astronomical Society's 42nd annual meeting of its Division for Planetary Science that Saturn's rings may have formed from part of the icy outer crust and mantle layers of a giant moon around Titan's size which was broken up by tidal forces before the rest of the moon fell into the planet. The lost primordial satellite would have to be large enough to have differentiated with a rocky core, which was absorbed by the planet. Saturn's rings are estimated to be comprised of around 90 to 95 percent water-ice, today, where its small amount of rocky material probaby came from impacts with interplanetary dust and micro-meteoroids. 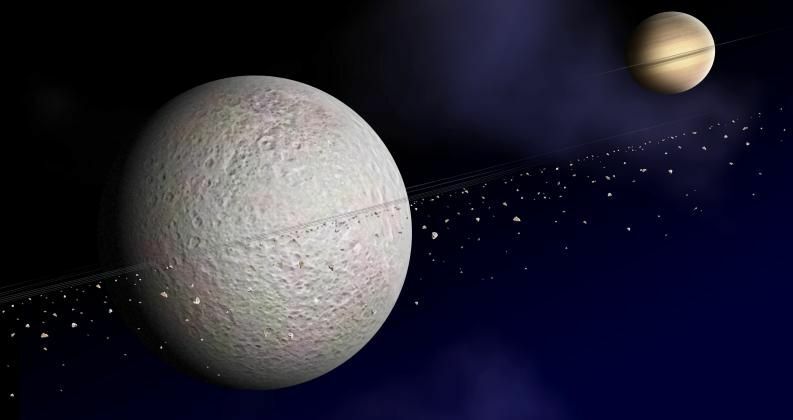 Over time, the rings lost much of their mass and generated icy moons at its outer edge, including its inner moons Enceladus, Tethys, and Dione, which are considered to be anomalous because they are composed of nearly pure water ice. Past theories involving the break up of a smaller moon would have left more rocky materials in Saturn's rings, and the tidal disruptions of comets should have occurred much more often at Jupiter, Uranus and Neptune than at Saturn. Saturn has only one large moon of the size of Titan, possibly because giant satellites orbiting between the planet and Titan can be pulled in by the planet's gravity and density wave interactions with its gaseous proto-satellite disk towards the end of the period of moon formation (DPS presentation abstract; Robert Lovett, Nature News, October 5, 2010; and Katia Moskvitch, BBC News, October 6, 2010). NASA -- larger illustration (more). space from Saturn's moon Enceladus. Saturn's E ring, made of micrometer-sized particles, is suspected of having been created by ice geysers on Enceladus. When parts of the moon were photographed by the Voyager spacecraft in the early 1980s, they looked unusually smooth as if they had been recently resurfaced like ice rinks by watery volcanoes or geysers. 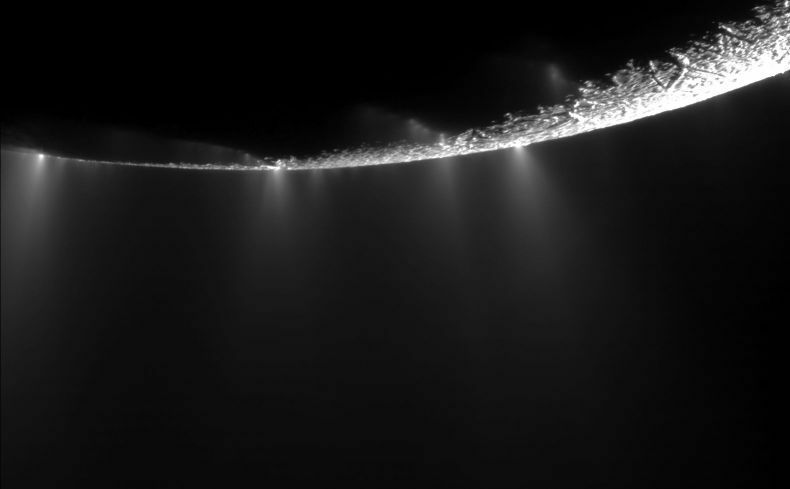 An erupting geyser on Enceladus would eject more material to sustain the E ring and temporarily brighten it (more). 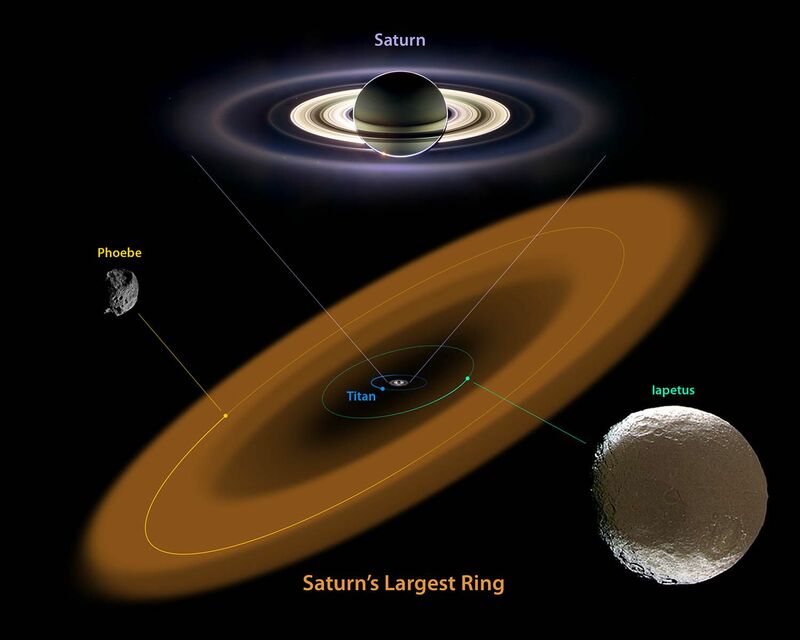 On September 19, 2006, the Cassini-Huygens Mission announced that a new, very faint ring had been found. Visible outside the brighter main rings of Saturn and inside the G and E rings, it coincides with the orbits of Saturn's moons Janus and Epimetheus (more discussion and images available from NASA's news release). More on Saturn's ring system is available from NASA's Planetary Rings Node. orbit of its moon Phoebe (more). On October 7, 2009, astronomers using NASA's Spitzer Space Telescope announced the discovery of an enormous torus of tenuous dust and ice particles around Saturn. Orbiting far outside the gas giant's many visible rings, the structure is only visible in infrared wavelengths. With an orbit tilted 27 degrees from Saturn's bright rings, the bulk of this enormous dust halo starts about 3.7 million miles (6 million kilometers or km) out from the planet but extends outward another 7.4 million miles (12 million km). Some 20 times the diameter of the planet, the halo envelopes the retrograde orbit of Phoebe, one of Saturn's outer satellites, which is probably generates the dust of the halo through meteoric impacts. The astronomers believe that some of the dark and dusty material from this halo is being pulled inward by Saturn's gravity inwards toward Iapetus, where its dust and ice particles are colliding with the icy moon and darkening a large portion of its otherwise pale surface (more from Spitzer, Science@NASA, and Astronomy Picture of the Day). beneath its icy crust (more). On March 9, 2006, scientists also announced that ice crystals found erupting from the south polar region of Saturn's inner moon Enceladus appear to originate in tidally heated and pressurized water reservoirs tens of meters under the moon's surface, and speculated that the crystals can be sampled for evidence of life (more). Subsequently, on December 15, 2008, scientists announced at the Fall 2008 Meeting of the American Geophysical Union" that the latest high-resolution images of Saturn's moon Enceladus suggest that its south polar surface changes over time. The moon exhibits Earth-like spreading of its icy surface at crustal fractures, but the spreading is asymmetric as it's almost all in one direction "like a conveyor belt," unlike the subsea plate crustal splitting and plate spreading (tectonics) at mid-ocean ridges on Earth. Enceladus' southern polar region is also home to occasional jets of water vapor and icy particles (with traces of carbon dioxide and monoxide, volatile gases, and hydrocarbons) that spew from vents within the moon's so-called "tiger stripe fractures," which create a huge plume of vapor and icy particles that extends into space and affects Saturn's magnetosphere. The scientists believe that convection movements in a subsurface sea of water may be responsible for the observed crustal splitting and spreading (more from Cassini news release; Astronomy Picture of the Day; and Jonathan Amos, BBC News, December 16, 2008). only one to have a significant atmosphere (more images). By increasing proximity to Saturn, the middle moons are Iapetus, Hyperion, Titan, Tethys, Dione, Rhea, Enceladus, and Mimas. While Iapetus has about four-tenths the size of Earth's Moon (1,440 km or 710 miles), Hyperion is a more like an irregular asteroid at 350 by 200 km (or 220 by 120 miles). 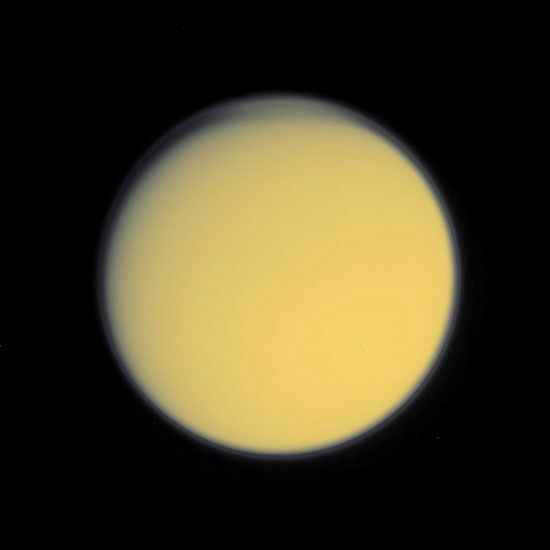 Titan, however, is the second largest moon in the Solar System and the only one to have a significant atmosphere. Tethys, Dione, and Rhea are around 1,000 to 1,500 km (620 to 930 miles) in diameter, while Enceladus and Mimas are 500 and 390 km (310 and 242 miles) across, respectively. On March 6, 2008, the Cassini mission reported evidence of orbital debris around Saturn's second largest moon Rhea (which is around 950 miles or 1,530 kilometer wide). If confirmed, the finding represents the first discovery of rings around a satellite rather than a planet. 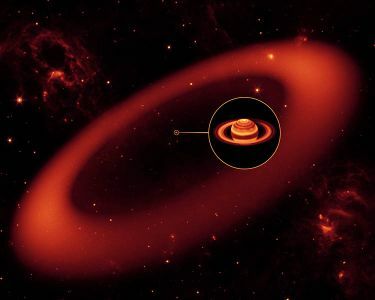 The ring debris revealed its presence by blocking the flow of energetic electrons around Saturn, which are trapped by the planet's magnetic field. This blocking effect was observed by the Cassini spacecraft as it passed about 311 miles (500 kilometers) away from Rhea in November 2005. As Cassini approached Rhea, the flow of electrons had a mostly gradual decline with three sharp downward spikes before the moon itself completely blocked electron flow to the spacecraft; this effect was reversed when Cassini emerged on the other side of the moon, when the electron flow exhibited an overall gradual rise with another three sharp downward spikes (more). Larger and jumbo false-color ultraviolet images. Voyager probes (more at APOD from Cassini and Voyager). 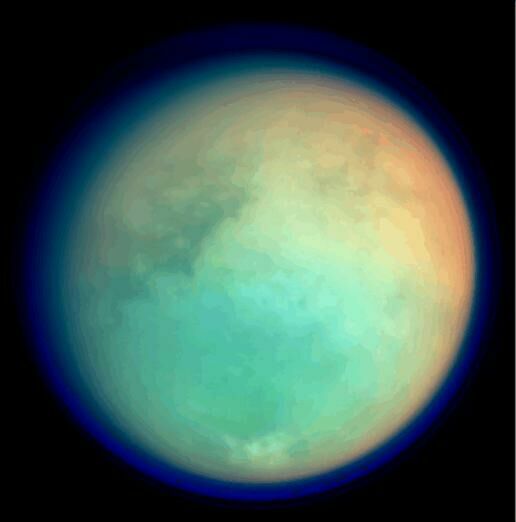 For a moon, Titan has a relatively large diameter of about 5,100 km (or 3,200 miles). However, it is tidally-locked to Saturn and so always presents the same face towards the planet. The moon is the only planetary satellite to have an unusually thick atmosphere, mostly composed of nitrogen like Earth's but as much as a tenth of methane and smog, with traces of ethane, acetylene, ethylene, and hydrogen cyanide. Titan is so cold at around -180� C (or -292� F) that its atmosphere is surprisingly dense, resulting in a surface air pressure about 1.6 times that of Earth's. Courtesy Jet Propulsion Laboratory. Copyright (c) California Institute of Technology, Pasadena, CA. All rights reserved. 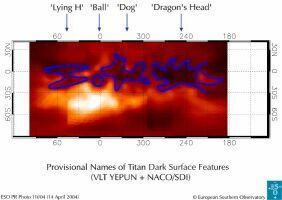 Near-infrared observations have detected small clouds of methane gas forming and dissipating in the upper reaches of Titan's atmosphere. These clouds lasted about two hours and then faded away, presumably because the methane condensed as enormous raindrops (or even as snow) and dropped out of the hazy clouds at a snowflake-like pace through the thick atmosphere. 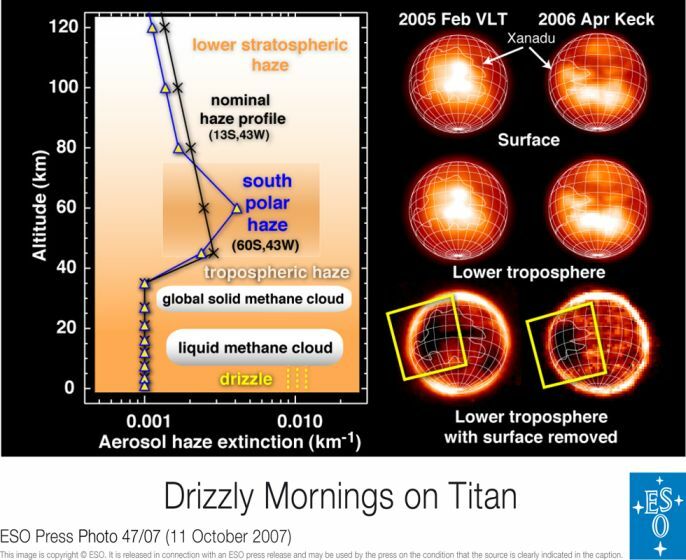 Eventually, surface methane evaporates into its atmosphere as part of Titan's "methane cycle" -- somewhat like the water cycle on Earth that is driven by incoming heat from the Sun (Griffith et al, Science, October 20, 2000.) 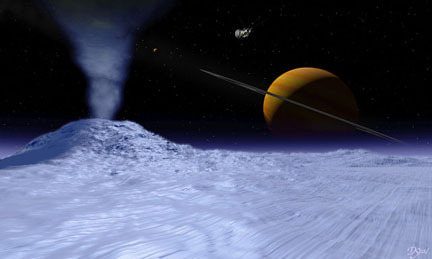 On January 14, 2005, the Cassini's Mission's Huygens probe observed Titanian atmospheric and surface conditions that were consistent with the "rainfall" of liquid methane and smog particles as well as the erosion of water ice rocks and loose sandy or clay-like terrain by liquid methane (press release). dark areas on its surface (more). 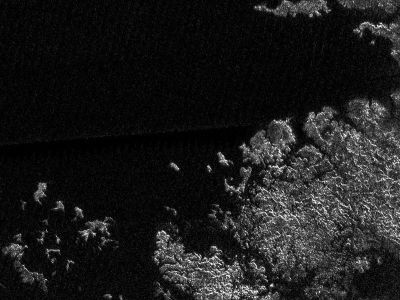 Titan's surface is cold enough to have pools -- even seas -- of liquid methane (and perhaps nitrogen) and for frozen methane to persist for extended periods. Moreover, gasoline-like liquids may also precipitate out of its atmospheric smog as liquid hydrocarbonates in huge, relatively dark pools or "seas" (ESO press release with more images). On September 14, 2006, the Cassini-Huygens Mission announced that it had detected what appears to be a massive ethane cloud surrounding Titan's north pole which might be snowing ethane snowflakes into methane lakes below (press release). While no bodies of liquid larger than large lakes have been detected on Titan by the Cassini/Huygens probe by July 2006, the moon does appear to have an abundance of the organic molecules that are thought to be the precursors of life on Earth (more). In 2007, the Cassini Mission directly imaged (by radar) what appeared to be "seas" of liquid methane, ethane, and possibly other hydrocarbons. On July 24, 2006, the Mission announced that radar images revealed what may be large lakes of methane and ethane sprinkled all over the relatively colder, high latitudes around Titan's north pole. Connecting channels (with shapes suggesting that they were carved by a liquid) lead in and out of black patches that essentially reflect no radar signal and so must be extremely smooth like a liquid surface. Some black patches have rims that could be deposits formed from liquid evaporates (more from NASA and APOD). 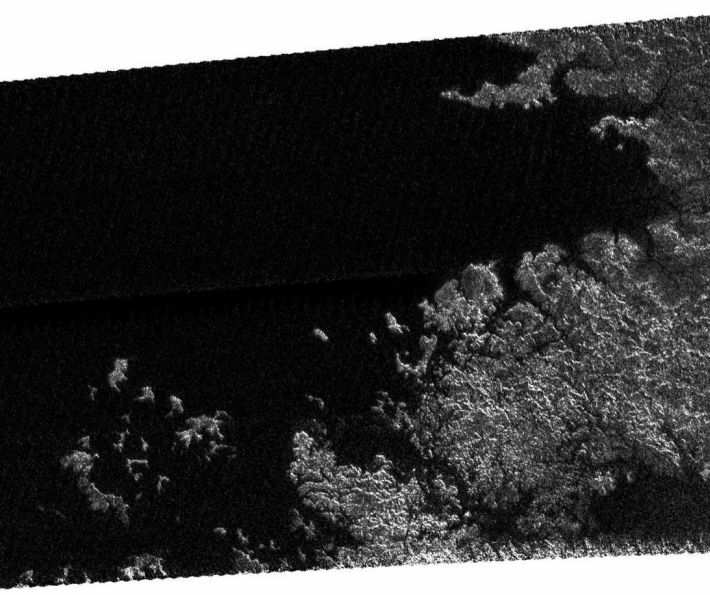 On May 12, 2007, Cassini-Huygens Mission presented radar images showing the coastline and numerous island groups of a portion of a large sea, consistent with a larger sea observed previously on March 29, 2007. The image reveals channels, islands, bays, and other features typical of terrestrial coastlines. The sea (which is most likely a combination of methane and ethane) has a dark surface and relative absence of brighter regions suggest that its depth exceeds tens of meters (tens of yards). The presence of isolated islands, which follow the same direction as the peninsula to their lower right, indicate that they may be part of a mountain ridgeline that has been flooded. The area of Titan's northern hemisphere depicted is about 160 kilometers (or 100 miles) by 270 km (or 170 miles) and is centered near 70 degrees north latitude and 310 west longitude (more from NASA and Astronomy Picture of the Day). 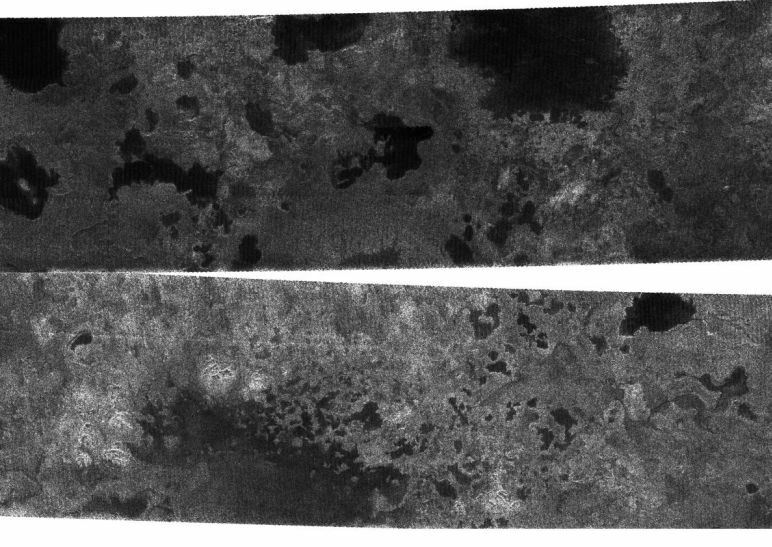 On October 11, 2007, the Cassini-Huygens Mission presented its first radar images of small lakes in Titan's southern hemisphere as well as those previously found around the North Pole (more from Cassini and from NASA. 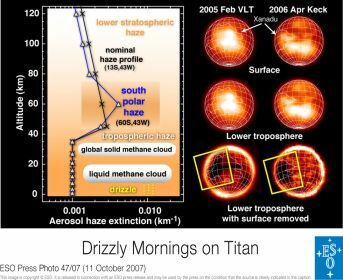 On October 11th, the European Southern Observatory also announced it detection of widespread and persistent, morning drizzle of methane over the western foothills of Titan's major "continent", Xanadu (ESO press release). On March 20, 2008, scientists analyzing small variations in the rate of rotation of Saturn's moon Titan announced findings (Science) which suggests that an ocean of liquid water lies between 30 to 90 miles (50 to 150 kilometers) beneath its icy surface, and which could possibly host Earth-type life (Lorenz et al, Science, March 21, 2008). Titan is about 3,200 miles (5,150 km) in diameter with a relatively low density and so may be composed mostly of water and rock. During the initial period after the moon's formation, residual heat from its formation and the decay of radioactive material should have melted much of its water to create an ocean. 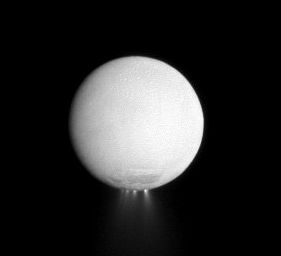 Recently, "cryovolcanoes" that may spew plumes of water and ammonia appeared to have been imaged by the Cassini mission. While much of the ocean may have frozen since, the scientists suggest a liquid layer between 60 to 120 miles (100 to 200 kilometers) thick may persist beneath an icy crust, particularly if ammonia is present to act as an antifreeze. Below the ocean may be a few hundred miles (or kilometers) of a heavier form of ice that may exist under higher pressures on above a rocky core roughly 1,800 to 2,100 miles (3,000 to 3,400 km (more from Cassini news release; Lorenz et al, Science, March 21, 2008; Richard A. Kerr, ScienceNOW Daily News, March 20, 2008; David Shiga, New Scientist, March 20, 2008; and Charles Q. Choi and Andrea Thompson, Space.com/MSNBC, March 20, 2008). More images about Saturn and its moons can be found at the Cassini-Huygens Mission and at NASA's Planetary Photojournal. 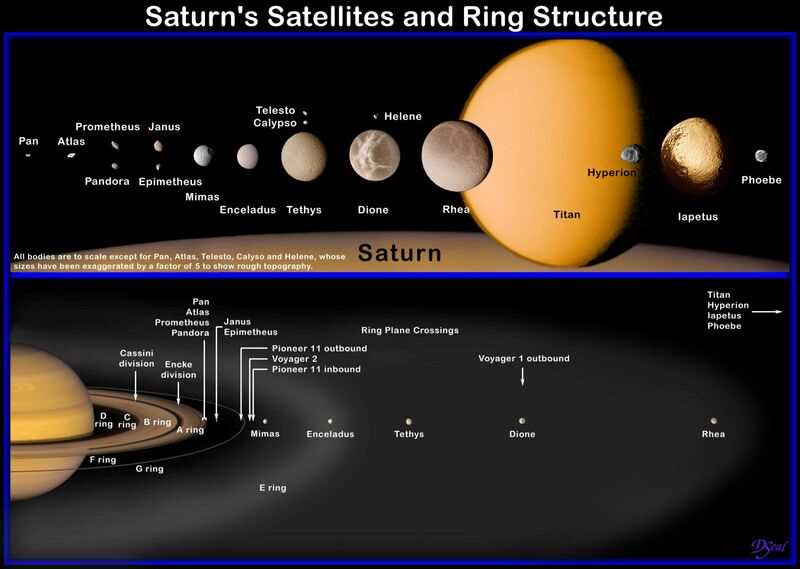 Fact sheets on Saturn and its rings and moons are also available from NASA's National Space Science Data Center. More information on the new satellite discovered on February 5, 2003 is available from astronomer Scott Sheppard at the IFA. David Seal (a mission planner and engineer at NASA's Jet Propulsion Laboratory at CalTech) has a web site that generates simulated images of the Sun, planets, and major moons from different perspectives and at different times of the year. Click here to try his "Solar System Simulator." For more information about the Solar System, go to William A. Arnett's website on "The Nine Planets", or to Calvin J. Hamilton's web page on "Saturn".